A Strip of mixed people and sounds, Liguria lies in Italy’s north-west, a region squeezed between rugged hill tops and sea waves, stretching from the French Riviera to Tuscany, bordering Piedmont and Emilia. Ligurianl is a five member outfit from Genoa and Savona comprised of voice, flute, musette (bagpipes), melodeon, mandolin, fiddle, guitar and piano, and they are among the most renowned contributors to the Italian folk scene. They play with passion and vitality, with a fairly eclectic repertoire that matches the spirit of the land and its people. Accordingly, Liguriani display a wide assortment of influences, ranging from local traditions to traditional Italian folk and political ballads, with Irish flavours and hints of bal musette and classical music. The lyrics are in both standard Italian and Ligurian dialects. The opener, “Stamattina Si Va All'assalto” a traditional World War I song, is given a sure-footed execution that showcases the energetic guitar of Claudio De Angeli, with sparks of Filippo Gambettas melodeon. ‘Boghe’ is a sprightly tune by flautist Michel Balatti, dedicated to a tasty, though underappreciated fish found in the Ligurian sea. Further standouts include dances of the four provinces in the Appennines, and “Perigurdino di Paganini” revealing the illustrious violinist'.s interest in folk dances. Further ettective numbers include “Sutta a Chi Tucca/Severino” and a dramatic song about the steamship Sirius wreck, incorporating a stirring instrumental theme. The brilliant piper Rinaudo penned the two tunes “Valse du Driveur/Jolanda”: the first arranged in manouche style, the second showing the groups subtle intcrweaving. The accomplished musicianship makes for a truly enjoyable CD. Ligurien liegt eingeklemmt zwischen den Bergketten des Apennin und dem Mittelmeer. Die Musik der Liguriani atmet diese beiden Welten, die Offenheit des Meeres und die Enge der Berge. Man spürt aber auch die Nähe zu Frankreich Okzitanien, zum Piemont und der Toskana. Fabio Bale (Gesang, Gitarre), Michel Balatti (Holzquerflöte), Fabio Rinaudo (Dudelsack), Filippo Gambetta (Diatonisches Akkordeon, Mandoline) und Claudio De Angeli (Gitarre) sind mit ihrem Ensemble ein ligurisches Pendant zur toskanischen Banditaliana von Riccardo Tesi. Ihr hier vorliegendes Debütalbum ist voll warmer, wunderschöner Melodien. Alle Musiker sind Meister ihres Fachs. Ob sie traditionellen Melodien Aktualität einhauchen, jazzige Passagen einstreuen, in die Barockmusik eintauchen oder eine Ballade anstimmen - die Musik der Liguriani ist zeitlos schön. Einer der vielen Höhepunkte ist die von Fabio Bale im Andenken an den 1944 von den Nazis ermordeten sizilianischen Partisanen Saphiren Raimondo geschriebene Ballade "Sutta a chi Tucca" (Severino). Wer da nicht zu helfen. Augen schließen, in die Musik eintauchen un genießen. Italie du Nord. Gênes. La Ligurie. Entre mer et montagne. Voila un CD qui ne peux que sonner juste aux oreilles de ceux que l'alchimie des instruments traditionells mis ensemble met en appetit. Et ça prend bien les oreilles. Pour un voyage qui débouche sur le terrain de la chanson. Pas de la chanson traditionnelle, mais de la chanson populaire. Entre la musette de Fabio Rinaudo qui se paye les désanchements de la valse... musette et l’accordeon diatonique (organetto) de Filippo Gambetta, une flûte irlandaise déploie ses volutes: celle de Michel Balatti. Une flûte fabriquee...en Australie par Michael Grinter! Derniers membres ou non les moindres, Fabio Biale ou violon et à la voix (une voix façon Riccardo Cocciante) et Claudio De Angeli à la guitare. Et pour une fois, ce qui pourrait être le tube est au bout du CD : Tiribi Taraba. Un exploit façon Fabio Biale. 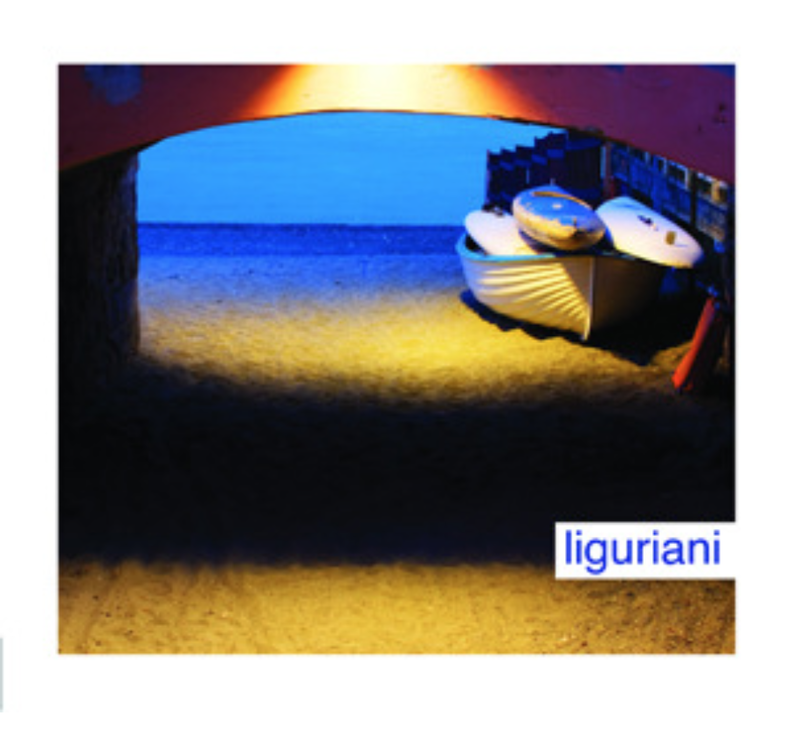 Liguriani are a fine quintet consisting of fiddle, flute, musette pipes, diatonic accordeon and chitarra. They power through Italian dance tunes like they are some sort of latter-day Mediterranean Bothy Band. However, they can provide more subtly swinging stuff as well as shown in two compositions by their piper Fabio Rinaudo; waltzes in the French musette style and like the first of these albums they dip into the classical repertoire for a dance tune, Pergordino, composed by Paganini. The other half of the album is songs and again they bring a catholic taste to their selection and the themes include love songs, a shipwreck, a partisan song and a couple from the First World War, ending with a delightful, jaw-busting tongue-twister piece. The group tip their hats to La Ciapa Rusa as an influence, but if anything Liguriani show a broader and more interesting approach than the group they were inspired by. Memoria e passaggio di testimone di generazioni diverse che hanno, ancora una volta, ricominciato a pensare la "tradizione"; magari facendo tesoro di chi ha immediatamente preceduto sulla stessa via, ricerca inquieta nell'oggi per trovare ancoraggi e spiccare balzi verso il futuro: tutto questo è il miglior folk revival italiano contemporaneo. E in questa squadra dai ranghi non troppo affollati metteremo anche il gruppo che ha scelto di chiamarsi, un po' ironicamente, Liguria, quasi fosse una traduzione dall'inglese. Il disco arriva solo ora, e parte subito con passe e attacco sicuro, segno che il progetto viaggia su gambe robuste e già allenate da molto lavoro precedente: basterebbe ricordare che un paio di anni fa furono il primo gruppo italiano ad essere invitato al più importante festival asturiano. La cornamusa di Fabio Rinaldo, l'organetto di Filippo Gambetta, la Chitarra di Claudio De Angeli, il flauto di Michel Balatti, la voce ed il violino di Fabio Biale: insieme, compatti, a raccontare, ancora una volta, di Resistenza sui monti e di danze suonate nelle Quattro Province, di Paganini e di ballate, e di vorticosi scioglilingua che farebbero inciampare chiunque. In scioltezza.